Yeabsra Goes to Grade 3! Yeabsra, who travelled to Canada with her mother Aynalem in 2011 and 2012 to receive treatment for her craniofacial cleft, received her latest report card and she received an average of 84% and received a slew of A+ and B+ marks! She will be attending grade 3 in the coming school year! Some adults and children in developing countries find it difficult to attend school, communicate easily, find jobs or get married. Seeing her excel at school has been a great source of pride for those who got to meet her. One of our driving goals is to support our partner teams to provide multi-disciplinary cleft care, so that children with cleft lip and palate have the best possible chance to live full, healthy lives. 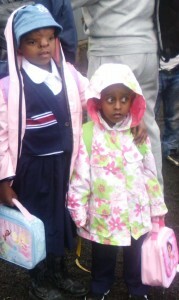 Yeabsra and Abel, her brother who is pictured here, go to a local private school. Yeabsra will continue to visit Yekatit 12 hospital for follow up care. Our thanks go out, once again, to all those who embraced the family while they were in Toronto and to those who continue to support our work.